Our fine art prints are produced on Hahnemühle media and printed with an Ultrachrome PRO giclee process up to 64" wide. We offer a wide range of fine art photographic papers including 100% cotton, alpha cellulose, aluminum, matte, watercolour and fibre emulsions. We also produce traditional stretched, gallery wrapped or boxed canvas prints with gloss or metallic finish. Our most diverse fine art paper. Photo Rag is a 100% cotton paper that features a smooth and clean finish. It out performs lesser matte papers in color density and gamut, making it ideal for any fine art print. Photo Rag is the most popular paper chosen by photographers to create high quality fine art prints. The fine, smooth surface and feel of Photo Rag make this paper very versatile and it is ideal for printing both black and white and colour photographs and art reproductions with impressive pictorial depth. Digitally replicate the look of dark-room fibre prints with our Fine Art Pearl paper. A bright white semi-lustre surface takes advantage of a giclée printer's entire color gamut, producing stunning images with amazing clarity. FineArt Baryta is a paper that sets the benchmark for high colour depth, large colour gamut and image definition. This paper gives the "wow" factor particularly to black and white prints with extremely high density and finest grey tones. Using barium sulphate in the premium giclée coating ensures the typical gloss that makes this paper a genuine replacement for traditional Baryta papers from analogue laboratories. The term "torchon" is taken from the French and means "coarse structure". The special surface texture of this bright white paper is a reminder of this. It can capture the timeless original beauty and three dimensionality of an artwork in its own special way. It is a natural and subtle watercolour featuring the look and feel of a hand-made paper. Torchon is ideal for hand torn deckled edges and float mount finishes. It's soft natural tone provides amazing black and white prints. Torchon is also a very popular for fine art duplication, when matching an original watercolour paper is desired. The look and feel of a fine sketching paper. With its matt watercolour texture this paper is a genuine mould-made paper in both look and feel. William Turner is ideal for reproductions of traditional artworks and also for striking and expressive photo reproductions. William Turner has a unique and soft emulsion that is a dimension beyond anything else available for giclée printing. Standard canvas prints with a glossy finish offer a fine structure which is particularly good for fine art photo printing. Its bright white point provides clear fresh colours and contrasts for black and white reproductions. Available Stretched and ready to frame, or as 2" Gallery Wrap prints. Metallic Canvas is a bright white giclée canvas with an extravagant metallic gleam. The novel surface impresses with an elegant silver and pearlescent gloss. The metallic finish on a fine structured fabric ensures an extreme lively and appealing image effect. The giclée coating guarantees photographs and art reproductions with extremely high densities, large colour gamut and sharp resolution. Available Stretched and ready to frame, or as 2" Gallery Wrap prints. Going beyond the limited gamut of competitors sublimation processed aluminum, Barrons offers true giclée processed aluminum prints. These are high impact and high colour gamut prints that are produced to "wow" the viewer. 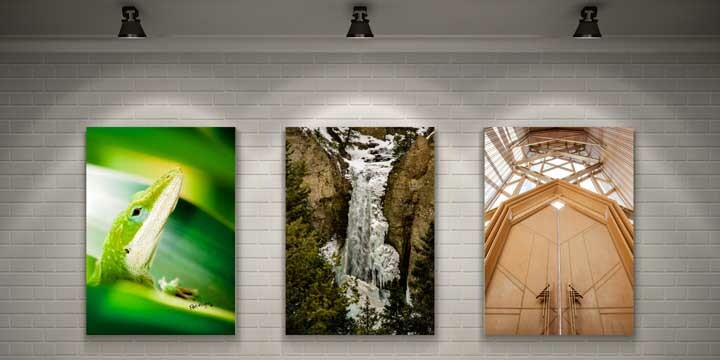 If you want a high end contemporary look for your images, look no further than these true aluminum giclée prints. Our 1/4", 1/2" and 1" thick acrylic prints give your prints the brightest and highest end modern look available. The crystal clear presentation of acrylic gives your image a three-dimensional depth that is unmatched by other finishing processess. Download our full catalog here for a complete size and price list for custom prints. Download our full catalog here for a complete size and price list. All prices, products and details are subject to change. Please call us at 817-348-8080 for current pricing and product offerings.